This 36-foot custom Topaz Sportfisher out of Tamarindo with Captain Manuel Leal at the helm, assisted by first mate Cheyenne Rosales, is one of the best-known boats in the North Pacific. 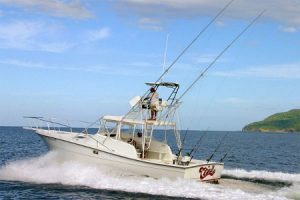 She features a full cabin with head and shower, marlin tower, outriggers, large cockpit with fighting chair and all-IGFA tackle. She will also go to Nosara and Guanamar/Carillo/Samara for multiple days.